I started with a Resin Car Works Illinois Central 33-foot hopper, which has some beautiful detail cast into a one piece body. Being one to never leave anything alone, I made a few modifications to the standard kit. The biggest change to this model was made by cutting off the cast-on hand grabs. New parts were formed from 0.012-inch brass wire and installed. 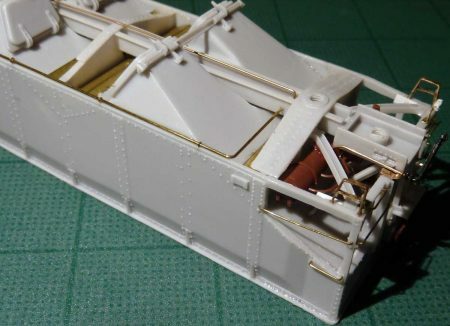 The bottom grab on each side is a drop type, as per the prototype photos on the page of extras at the RCW website. A short portion of A-Line 40-link per inch chain was installed below the handbrake gear housing. The kit supplied corner steps were thinned with a small Swiss Pattern flat file. I also made a Z-shaped step from 0.005 x 0.030-inch brass and soldered it into place for the intermediate step. Support braces were formed to join the side of the corner steps to the end sill, as seen in the photos. The support braces for the corner steps with the cut levers are slightly different than the other two. Cut lever brackets were made from 0.010 x 0.040-inch styrene. Kadee air hoses were installed in scratchbuilt air hose support brackets made from 0.004 x 0.040-inch brass. This is a method that I just learned from Pierre Oliver on a Train Master video (via Model Railroad Hobbyist pay subscription). Pierre credits Ted Culotta for this method. Kadee hoses are nice, but oh so delicate. Partial brake lines and rigging were installed on the underframe using brass wire. A pull rod for the air bleed valve was made using 0.008-inch wire. 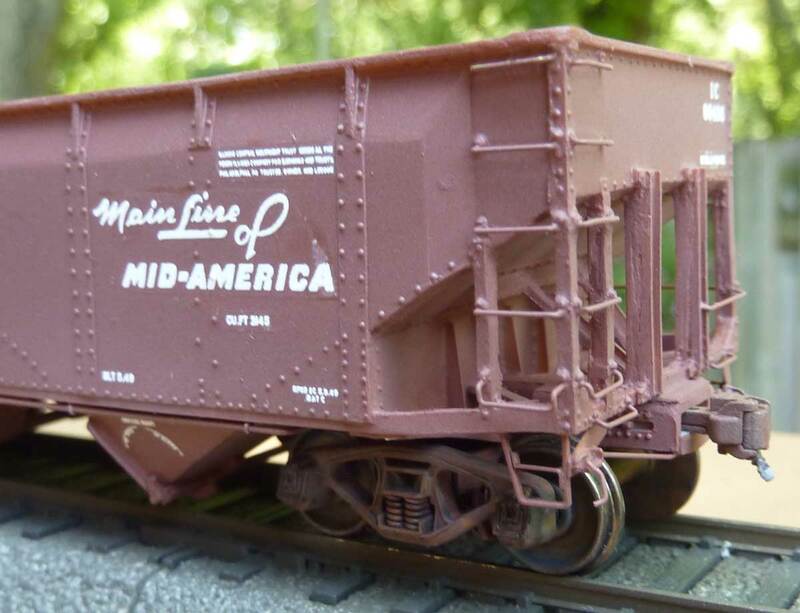 Tahoe Model Works Barber S2 trucks were used with Intermountain code 88 semi-scale wheelsets. Sergent Engineering couplers were installed in the Resin Car Works coupler boxes. 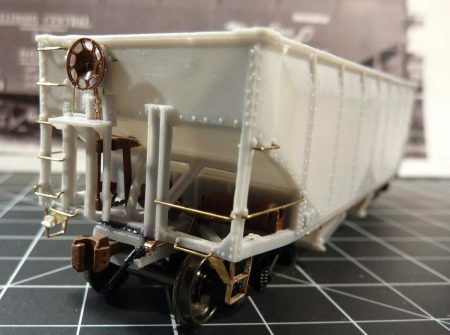 The model and truck side frames were prepped for the paint booth by blasting them with baking soda using an air eraser from Harbor Freight. The car was primed with Model Masters Primer. 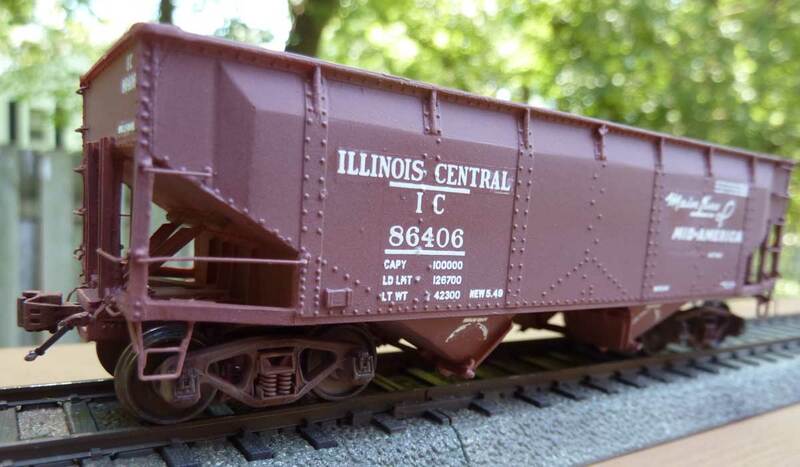 I mixed my own color for the Illinois Central red. 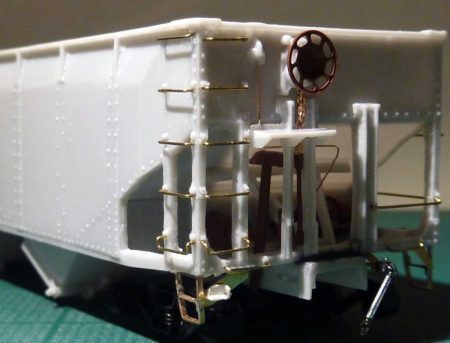 I used Model Masters Oxide Red and Floquil Polyscale Reefer White in a ratio of 6 parts oxide red to 1 part reefer white. I’m not sure if it is 100% accurate, but it looks about right to me. After the paint had dried thoroughly, two coats of Pledge Floor Finish were sprayed onto the model for a gloss coat. The decals were applied after the gloss had dried. 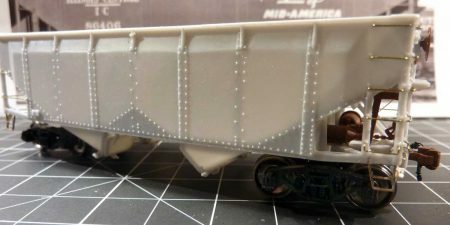 A third coat of Pledge and a couple coats of Model Masters Clear Flat were applied after the decals were in place and dry. Light weathering has been applied to the trucks using AK Interactive Enamels and Washes. These are new to me and I will post some follow up photos of the weathered car after I practice my techniques a bit. The weathering is a bit difficult to see in the photos. On a side note, I used a tool I had purchased but had not really used much. 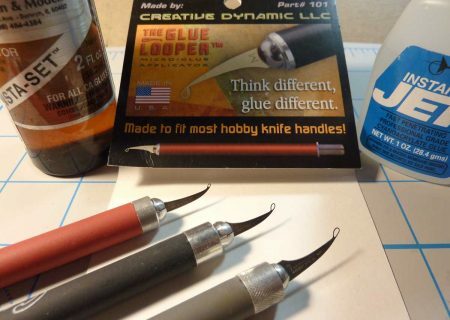 It is called Glue Looper from Creative Dynamics. It is made as an applicator for thin super glue. Three different size applicator tips come are in the package. Not only did it help getting the glue into some tough to reach spots for the slope sheet bracing, but I also found that I could use these to apply the CA Insta-Set Accelerator. To use it with the accelerator, I simply dipped the applicator into the bottle. The car is complete except for weathering. I like to let the flat coat dry for a couple of days. I hope to try out a few new techniques with the AK Interactive enamels. 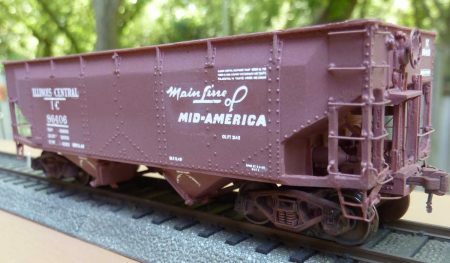 With a little luck, I’ll have this IC hopper and Santa Fe BX-26 box car ready for the St. Louis RPM in mid-August. Thank you, George, for sharing great techniques to upgrade the Resin Car Works hopper kit. Questions and comments can be posted below. Please follow the instructions so your comment can be posted. All comments are reviewed and approved before they appear. To subscribe to this blog, enter your info for a comment and check the last box to notify of new posts by email. Share the blog link with other model railroaders. Thanks Loren, and yes I plan to attend the SLTRPM. Nice work George. Hope to see it and you at STLRPM in a couple weeks. Don’t know if you have been here before, but you will find a lot of IC and ICG here.